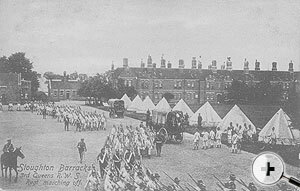 Turning our back on the Single Men’s accommodation, you would have seen acrss the green, the accommodation allotted for the use of the married soldiers who were borne on the Married Establishment of the Depot. 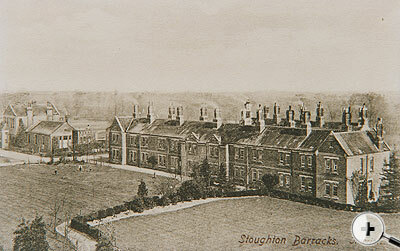 The Married Soldier's Quarters, now demolished. This consisted of two blocks, the foremost of which is plainly visible, providing accommodation for some forty families. Prior to the provision of Married Quarters, the Married men with their families, were accommodated in the same rooms as the single men, the only privacy they enjoyed being that which a blanket, hung between the single men and themselves afforded. 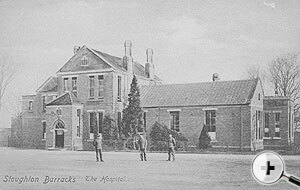 The Hospital, now demolished | 3rd Bn Queen's Royal West Surreys move off for service in South Africa. c1899. On the left of the building, downstairs, the Infant School was situated, the modernization of the quarters by the addition of bathrooms reduced, slightly, the number of quarters that were available.